First of all, get your mind out of the gutter! 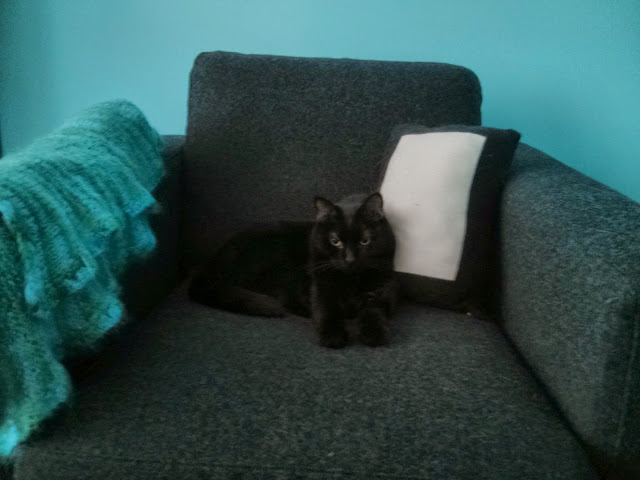 A horny growth is not what you think, let me tell you about it... this past week we had to take Vicktor Frankenstein kitty to his vet. 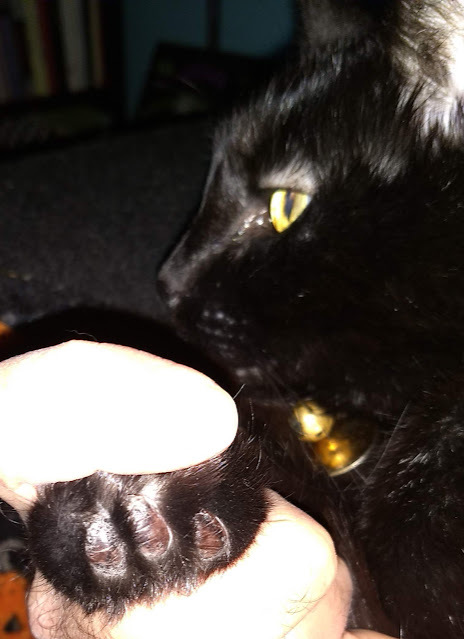 Both of our cats have their claws, and we trim the front ones on a regular basis, but noticed that Vicktor's one claw looked like it was growing into his paw pad. He didn't seem to be bothered by it. We weren't sure if it was an ingrown nail, going to become an ingrown nail, or a claw that didn't lose it's sheath yet. 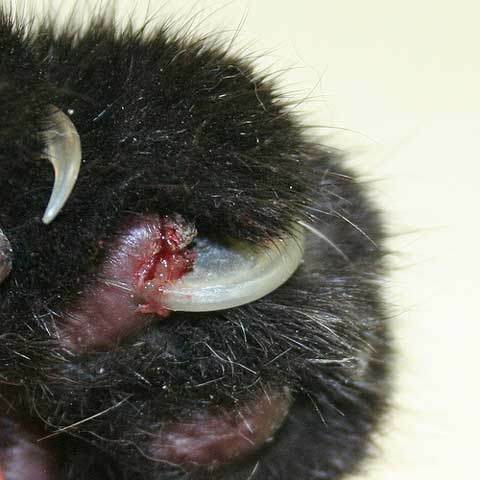 Here's a picture of an ingrown cat claw. It grows and curls into the paw pad. Note: this is NOT Vicktor, but we were concerned that his nail was going to turn into this. Yikes! Better safe than sorry. Well the good news is that this DID NOT happen. The vet tech looked at Vicktor's paw (our vet hospital is great because this time of year they perform free cat nail trimming with a donation of a non-perishable food item for the local food pantry) and she said after trimming all of his nails, "he has a horny growth" (the twelve year old in me smirked) and she took the nail clippers and simply cut the lump from his paw pad. Wha? I was dumbfounded. What the heck is a horny growth and how did you just clip it off?!!! I learned something that day, a horny growth is also known as a cutaneous horn. It's composed of keratin overgrowth and usually found on one or more of the foot pads of some cats. If the horns are not causing lameness or discomfort they can be ignored or removed by trimming, however there may be regrowth, so basically for now we are just keeping an eye on it. I tried to get a picture of the trimmed growth. 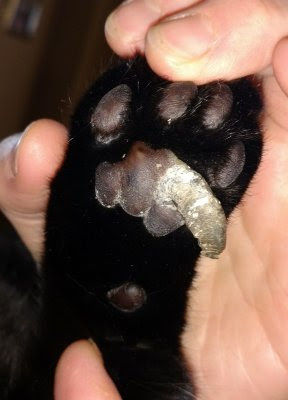 It's really hard to see but it was on the far left paw pad that's pictured. Here's what it could turn into! Again, NOT my Vicktor. This is gross looking, gnarly, and weird. He sure keeps us on our paw pads...er toes.